Guy Manoukian feat. Guest Stars Abu (from the famous hit – 3Daqat), Lena Chamamyan, Mario Reyes & Paul Santiago formerly known from the Gipsy Kings family. 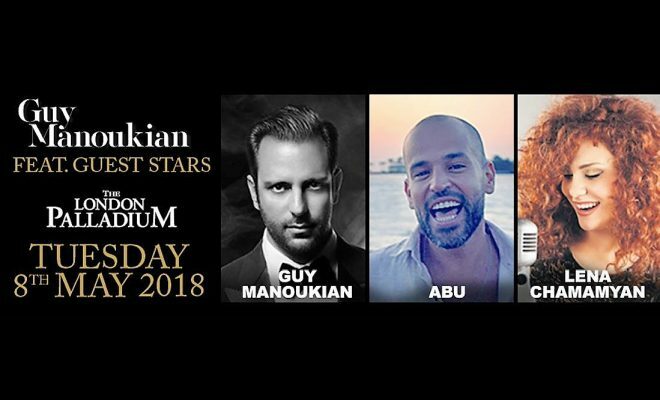 Internationally renowned composer and pianist Guy Manoukian returns to London for a sensational concert featuring renowned guest stars Abu and Lena Chamamyan as well as Gipsy King family members Mario Reyes & Paul Santiago. Guy has been on the international stage for the last 15 years. He has performed at sold-out concerts in Singapore, Cairo, Dubai, Kuwait, Abu Dhabi, Los Angeles and the Sydney Opera House to name a few. Joining Guy will be Egyptian singer Abu, an acoustic singer and songwriter whose hit cover of the song “3 Daqat” featuring Yousra has amassed over 220 million views on YouTube and has been collectively stuck in the head of the entire Arab world since its release last October. Syrian-Armenian singer, Lena Chamamyan is a musical trailblazer, ranked among most influential figures in the Arab world, and rated five stars as world singer. She creates a unique style blending traditional styles of eastern songs from the Arab world and Armenia with western classics, all without compromising the music’s innate spirit and sense of improvisation, especially on stage. Last but not least, renowned Gipsy King family members Mario Reyes and Paul Santiago will take the audience on a journey through a diverse range of genres spanning from flamenco and Catalan numbers to Arabic inspired compositions. With this eclectic mix of talent from Guy Manoukian and his guest stars, this evening of world music promises to be absolutely unmissable. In aid of the British Lebanese Association Scholarship Fund.